The USCF and Chess Life Online are happy to report that IM Josh Friedel won this year's Samford Scholarship. Born in New Hampshire in 1986, Josh now lives in the Bay Area where he often trains and travels with last year's Samford winner, IM David Pruess. Since David still has one year left of his scholarship, the two can sometimes travel and train together. Josh has a FIDE rating of 2474 and two GM norms to his credit- one from the 2005 East Bay Masters and one from the 2006 U.S. Championship. Josh says: " I'm very excited, mainly because I can play many more tournaments like Cappelle without worrying so much about money. As far as for Chess Life Online readers, this means they'll get to read many more silly reports." Josh has a popular, comical writing style, as can be seen in his CLO reports on Capelle Le Grande (Part II)and the Reno Western States Open. You can read a short Chess Life Magazine profile of Josh. For more details on the following press release, contact Allen Kaufman, the Secretary of the Samford Fellowship. 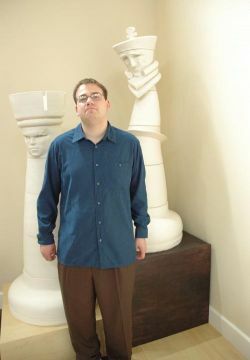 Josh Friedel, a twenty-year-old international master, has been selected as the twenty-first annual Frank P. Samford Jr. Chess Fellow. Born in New Hampshire, he has lived in San Francisco since August of 2006. Josh learned chess at the remarkably early age of three and began tournament play at age six. In 1995 he scored his first tournament victory, winning the New Hampshire State Amateur (under 2000 rating) Championship at age eight. The next year he won the kindergarten to grade 3 nationals with a 7-0 score and then became a master at age thirteen. At that point Josh began training with grandmaster Larry Christiansen. Friedel’s first major open tournament victory was in 2001 when he won the Pan Am Open with 6½-½. Two years later he tied for first in the Eastern Chess Congress. Josh also participated in two U.S. Championships, earning a grandmaster norm in the most recent competition. Josh is the current champion of both New Hampshire and Northen California. Outside of chess, Josh’s main interests are tennis and sailing. He is also interested in politics, human biology, cooking, reading and movies. The late Frank P. Samford, Jr. of Birmingham, Alabama, was a distinguished attorney and CEO of Liberty National Life Insurance Company (now Torchmark). Mr. Samford was active in civic, business, political, educational and cultural affairs. He was also an enthusiastic competitor in chess tournaments. In 1986 Mr. Samford decided that he would like to do something significant to promote the game he loved, particularly to help talented young chessplayers. He created the Samford Fellowship to identify and assist the best young American chessmasters by providing top level coaching, strong competition and access to study materials. The Fellowship also provides a monthly stipend for living expenses so that the winners may devote themselves entirely to chess without having financial worries. The total value of the Fellowship is approximately $32,000 annually for two years. The winner was chosen by the Samford Fellowship Committee, consisting of Frank P. Samford III (son of Frank P. Samford, Jr.), former U.S. Chess Champion Grandmaster Arthur Bisguier and International Master John Donaldson. The winner's potential was determined based on his chess talent, work ethic, dedication and accomplishments. Generous contributions from Mrs. Virginia Samford and Torchmark Corporation support the Fellowship. The Samford Fellowship is a fitting memorial to an extraordinary man. The dedication, creativity and achievement that marked Mr. Frank P. Samford, Jr.'s life are examples for all chessplayers to admire and emulate.